This quote has resonated with me since I first read it because of my career in human resources and the “soft skills” dilemma that those in my profession understand as we struggle to promote these skills in the workplace. Soft skills, or people development skills, have not been given the same consideration as the harder operational skills, because of the belief that they don’t impact the bottom line as directly as the accounting and loss prevention departments do. We now know that recruitment, retention and training skills are reaching a critical mass. Businesses now believe that these so-called soft skills, these “luxuries to be addressed after the urgent problems are solved,” are becoming hard skills trained as a matter of expectation due to ongoing demands in the workplace being at an all-time high. One of the most noticeable and alarming effects of the increasing demands in the workplace is the much greater levels of stress, leading to high turnover, absenteeism, increased disability claims, lawsuits and, worst of all, rising incidences of workplace violence. Companies can no longer avoid dealing with what we call the “soft” issues such as stress, training and employee morale. This is because an abundance of research shows that neglecting these issues is significantly debilitating people, productivity and, consequently, profits. It’s important to set the tone of this series of articles by first explaining how the kindness movement in North America began. Kind acts aren’t new to the world, but one woman stood up for an ideal that sent ripples of hope around the world; she was Anne Herbert, a California journalist. Anne Herbert was a columnist during the early eighties who coined a phrase simply by chance that has become one of the most famous quotes of our time. From bumper stickers to key chains, this profound piece of advice reads “Practice random acts of kindness and senseless acts of beauty.” Herbert grew tired of hearing news of random acts of violence on the news, something I think we can all relate to. She decided to do something about it and challenged her readers to change this negativity to a positive by promoting the opposite. She encouraged them to go out and commit random acts of kindness. Her method was simple. Convinced that people needed to hear more good news, she started to write stories about kindness and encouraged her readers to join in by spreading good news rather than negative. Stories of random acts of kindness started to flood in from around North America. Stories told of people paying for the car behind them at a toll both, letting cars in during rush hour, paying for someone’s coffee in a café, and on and on. promotion of kindness, November 13 was officially declared World Kindness Day. 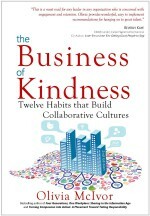 So how does an organization, or better yet, the individual leader, make the leap to tabling the word “kindness” at work without being ridiculed out of the room, perceived as someone who is more interested in promoting those things considered “light and fluffy” than the crucial bottom line? Kindness, in my opinion, goes to the heart of the matter. Our society is built on a foundation of many different types of relationships, which connect individuals to families, friends, work colleagues, communities, countries and our global community. From the playgrounds to the boardroom and into our courtrooms, relationships are at the very heart of our challenges as well as our solutions both personally and professionally. The way we affect each other relates to the quality of our interactions and ultimately determines the health, well-being and success of our employees and our society as a whole. Leadership is all about relationships, and no matter how hard a leader may try to ignore the fact that their team members are bringing their personal lives to work, the reality is that they cannot be expected to leave a part of who they are in the parking lot. Although this has been the trend for most of our careers, it no longer will fly in the face of the new generations entering the workplace, and the older baby boomers are finally saying enough is enough. Together we will see the workplace take a positive and constructive turn over next few years as the issue of life/work balance comes to the forefront as a recruitment and retention tool. We all know what it means to be kind — how it feels to be the recipient of a kind act — and the rewards of committing a random act of kindness upon another human being. It does not take days of training seminars or piles of manuals to teach people how to be kind to one another. Kindness is something that each and every person knows how to do and can appreciate across all cultures, religions, genders and age barriers.